In Spring, a designer's mind turns to ... PLAY! Well at least mine did when I was given the opportunity to interview Amy Dickinson from the play-minded group KaBOOM! for the most recent issue of the Association of Children's Museums' (ACM) journal called Hand to Hand. The post that follows below is based upon that interview, and is posted with the kind permission of ACM. By way of reference, Amy Dickinson is the manager of training and education at KaBOOM!, a national nonprofit working to create a great place to play within walking distance of every child and dedicated to advocating for play in the lives of children and communities. She holds a B.A. from Syracuse University and an M.F.A. from the University of Massachusetts, and has served in both AmeriCorps and Peace Corps. ORSELLI: What is the minimum kit of parts or the minimum requirements to make a good playground? DICKINSON: I have a really expansive notion of what a playground—or any playspace—can be. You don’t need a lot: any area where there are things that children can manipulate, have fun with and get engrossed in is playspace. Are you familiar with New York’s Pop-Up Adventure Playgrounds? They put together reused and recyclable materials and take them out for a day or an afternoon to a park, a block party, a street closed to traffic, a festival—any public space—and invite the community to come and play: to build, paint and create as they see fit. ORSELLI: This collection of modular play materials builds on the tradition of adventure playgrounds, started in the U.K. and Europe, that took familiar materials and twisted them into playful situations. DICKINSON: Exactly. Morgan Leichter Saxby, one of the two people who started Pop Up Adventure Play, was a U.K.-trained playworker who had worked with the well- known British playworker Penny Wilson. Trained playworkers are key to adventure playgrounds, and Pop-Up Adventure Playgrounds are based on similar principles: supporting and facilitating the play process and acting as advocates for child-directed play when encountering adult-led agendas. ORSELLI: What are some of the biggest impediments to fostering children’s play in any environment? DICKINSON: The first one is a lack of safe places to place. Only one out of every five children has a park or a playground within walking distance of his/her home. A second impediment that is definitely transforming children’s play is rising media usage among children and youth. And a lack of awareness about the importance of children’s play is impeding active play. And third? Less and less time for recess as we increasingly focus on standardized tests. Children’s time is getting more and more overscheduled—too many structured activities like soccer practice or music lessons rather than time to just roam around on their own and play in a child-directed way. ORSELLI: When I was a kid in Detroit in the late '60s and '70s my parents didn’t have any compunction about letting me or my siblings spin around on our bikes or go off with our friends and come back hours later. And this was in the pre-cell phone era when parents couldn’t be electronically tethered to their children. Is it harder now for parents, rightly or wrongly, to turn their kids loose in unstructured play situations? DICKINSON: Yes, and changing community life has a lot to do with it. When I think about my childhood, and the ways that I played—my parents were rarely in the picture. I roamed around freely with neighborhood groups of kids. But now in a lot of places people don’t know their community and they don’t spend time outside getting to know their neighbors either—kids don’t play in their front yards. Some parents are scared to let their children outside. They have a perception that it’s not safe—and maybe in some places it isn’t. Without knowing who lives around them, parents are frightened to let their children out into the unknown. Parents are also under a lot of pressure, including social pressure, to make sure that they are doing the best possible things for their children. DICKINSON: Yes, but sometimes being a “good parent” is actually to the detriment of the child. Even with the well-meaning intentions of taking the best care and making sure that nothing happens to your child, in actuality, kids need some chances to fail, to make mistakes and to mess up so they can learn. It’s completely understandable that a parent wants everything to go well for their child, but with the social pressure from other parents, many parents feel like they’re being judged. Are they successful parents? Are they setting the child up for success by enrolling them in this activity or that sport? It has become a little cycle that some people want out of. But it’s hard when you feel that social pressure. ORSELLI: What aspects of play that KaBOOM! fosters might be transferable to other play environments, including children’s museums? DICKINSON: I’m not an expert on children’s museums, but last fall I visited the Providence Children’s Museum where it was wonderful to see kids so engrossed in many different child-directed play environments. Everything and everyone in that museum encourages play—interacting with multiple sensory materials, multiple environments, both indoor and outdoor. 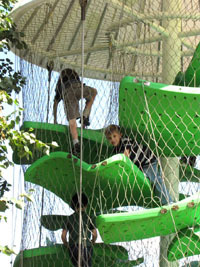 And the museum offers a lot of different ways that kids can experience risk or challenge themselves by moving up in different levels of an activity whenever they’re comfortable. They have an awesome climber outside. In terms of physical structure, I’ve never even seen anything like it before. The whole museum is very thoughtfully designed for caregivers as well. The Power of Play exhibit, for example, has a lot of activities where children can direct their own play and try things out, like shooting little scarves through tubes. But the exhibit also has quotations, books and other prompts that encourage parents to stop and reflect on the importance of play. The exhibit both encourages children’s play while it encourages parents to stop and think about how their children are playing and the kinds of play that are occurring. One of the most eye-opening experiences for any adult is to watch children play without interfering with them and just think about what’s going on there. You gain a sense of awe about what happens when kids are playing. ORSELLI: What is your take on indoor playspaces versus outdoor playspaces, especially in terms of safety and perceptions of safety? DICKINSON: Play can occur anywhere. Outside play is important especially nowadays when children are spending less and less time outside. But playing inside is valuable, too. If it’s not possible to go outside because of neighborhood safety concerns, then create indoor play environments. As far as physical safety goes, kids encounter safety concerns no matter where they play. You can get hurt doing anything. Heights come with the possibility of falling; sharp jutting things can cut people; people can get tangled in dangling ropes or fabrics. The idea is to weigh the benefits of an activity versus the risk that some type of harm might happen. When we walk, we could trip, fall and get hurt but we don’t ban walking. Interestingly enough, if we try to make an environment too safe, we often encourage children to seek out other types of behavior that might bring the risk of more serious harm. British child development expert Tim Gill, author of the 2007 book No Fear: Growing Up in a Risk Averse Society, talks about moving from the idea of “risk aversion” to “risk management,” and that makes a lot of sense to me. By simply starting conversations about play and risk and by encouraging people to observe children’s play and to think and talk about what they see happening—the risks they see being taken and the things that might be learned from them—can do a lot in terms of changing attitudes. And remembering how we played as children and by making it a point to take time to play—to experience the wonder and discovery of it for ourselves—helps us understand and value it. ORSELLI: Are there any specific play researchers that you admire? DICKINSON: The American Academy of Pediatrics’ statement on play is one of the best and most comprehensive documents. It includes not just impediments to children’s play, but the benefits and value of play for children and for families. It’s easy to access online as a free, downloadable PDF. Dr. Ken Ginsburg, who I believe was its main author, is an eloquent spokesperson on behalf of children’s play, their rights and general wellbeing. I also love The Playworks Primer written by British playworker Penny Wilson and published by the Alliance for Childhood. It captures what’s important about play, but is written in such a whimsical way that it doesn’t lose the magic of play. And is also available online as a free, downloadable PDF. Wilson is another powerful play advocate and somehow manages to capture your imagination and make you remember what it’s like to be involved in play—to give yourself over to it. That’s still an important feeling for children. Joe Frost’s decades-long body of work on children’s play and designing environments and identifying obstacles to children’s play is invaluable. Roberta Golinkoff and Kathy Hirsh-Pasek are doing great work on the value of play in educational settings. The work of Tim McGill, mentioned earlier, on the topic of risk has helped shape the way I talk with people about what to include in play environments and how important challenge is for children—thinking about risk benefits, not just being averse to the idea of risk. 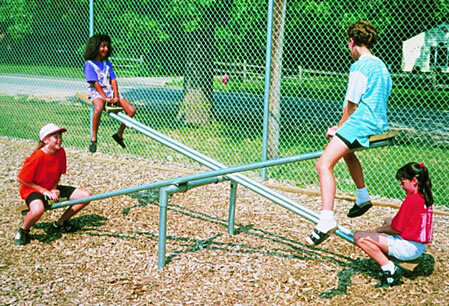 ORSELLI: Do you mourn the loss of monkey bars, seesaws or their equivalents? DICKINSON: The seesaw is my absolute favorite piece of playground equipment. I have a scar on my hand from falling off a seesaw. It’s ironic that I lament the fact that it’s really difficult to find an old teeter-totter, just a plank of wood going up and down. But equipment like teeter-totters teach us to overcome our fears; they also teach us to fall down and get back up again. ORSELLI: And to be careful with who’s on the other side of that seesaw! DICKINSON: Right—social learning! It also teaches us how to do it better the next time. Learning self-regulation and how to work in groups comes into play a lot when kids have the opportunity to direct their play. Our tendency is to intervene when we see children roughhousing, which I relate to this whole conversation about risk. Last fall I was working at the Ultimate Block Party in Baltimore where we had Imagination Playground blocks set up. Two young boys were sword fighting and hitting each other with foam pool noodles. I almost intervened, but I thought, “Practice what you preach. Let them go.” And so I did, and no other adults stepped up either. They played like this for a long time, and it came close to ending when one of the boys got a bloody nose at which point they both put the noodles down. The bloody-nose kid walked away and got a Kleenex. When his bloody nose was over, they went back to playing but in a more restrained way. They had taught themselves some limits—how much they could hit and not have someone get hurt. ORSELLI: Have you noticed any commonalities or contrasts among people in different parts of the world in the way they think about play or play environments? DICKINSON: Wherever you go, kids play in very similar ways although they might use different materials, from manufactured soccer balls to balls made from rags tied together. When I lived in Paraguay, my thinking about children’s play underwent a revolution, and it had more to do with the adults’ attitudes towards children and their play. Kids played with things there that would shock people in the United States. Paraguayan children are given a lot of independence, but they also live in very tight-knit communities. Big extended families live near each other, and people often stay in the communities in which they grew up so they know each other really well. I was in a fairly rural area where everyone knew all their neighbors. 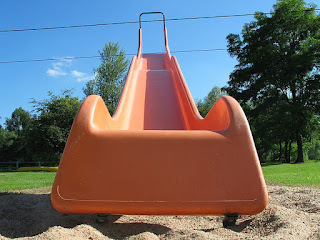 This allowed children a lot of freedom to run around and play with whatever they could find. There was a play structure in the town where I lived that would never be considered safe here in the United States. And interestingly enough, no one ever got hurt playing on it. Kids would play with whatever they could find, like scraps of lumber. They made their own mini-adventure playgrounds. And they just ran around a lot. The other thing I noticed there that you don’t see very often in the United States was cross-age play or multi-age play—two-year-olds up to sixteen-year-olds all playing together. If I could change anything about play or community life in the United States it would be more opportunities for multi-age play. Young kids learn a lot when they play with older kids, who in turn learn through their teaching and watching out for the little ones. When you give kids independence they can manage a fair bit of it. ORSELLI: Other than your seesaw scar, do you have any other play-related memories? DICKINSON: My dad was in the military, so we moved around quite a bit when I was young. Seems like we always ended up in developing towns, often in the Southwest, with lots of building going on. We didn’t have playgrounds or parks near us so we would go into houses under construction and find materials laying around—boards, nails and other hardware—and take them and go off and make forts. (Now when I think about it, it reminds me of an adventure playground.) We didn’t think of it as stealing. We considered scrap materials just laying around up for grabs. Once, my brother and I and a couple other neighborhood kids took some lumber from a construction site and made a little clubhouse in a nearby stand of trees. My brother, the clubhouse president, inscribed his name “Casey Dickinson, President,” and phone number. My dad got a phone call the next day from the construction workers! We also played a lot of games that sound really boring in retrospect but they were endlessly fascinating to us. We played physicist, which involved turning your bike upside down and using it as your “laboratory equipment.” We spent hours putting reeds or sticks through the spokes or pouring water over our pedals or things like that. ORSELLI: Describe your dream play environment—the sky’s the limit. DICKINSON: If you have dirt, water and materials you can move around, that covers it. When I think of my dream play environment, I think of my neighborhood growing up. There was a ditch behind our house. When it rained it would flash flood with all this rushing water and mud to play around in. There were little sandy parts, with reeds and other plants growing that you could pick and put together to make things. And other kids played there. A favorite playground is one where you have people to play with. Thanks Amy! It was fun interviewing you.